Welcome to Hacking With Care Wiki ! Find out what animates us and how to join ! Discover what we are currently working on and enjoy the free resources we have created in the Projects section in the sidebar. For more perspectives on care, browse through a thematic collection of articles, health info-sheets, first aid guidelines, zines and manuals in the Care section. Concerned about digital security, privacy rights ? Get more info and find some tools to protect yourself, your communications and data in the Ethical Tactical Tech Section. If you are new to the world of Hacking and Activism, welcome, check the Hackers ethics and History section ! We are a collective composed of hackers-activists, caregivers, artists, sociologist, which grows (quite literally!) by contact and affinity. Together we design, circulate, put in common resources and tools for care in accordance with hackers ethics and peer-to-peer philosophy. We create occasions for body & soul rejuvenation and collective (re)appropriation of care. We work with an understanding of the needs and requirements of specific contexts, as can be found in hacking and activism. We also share with caregivers hacker-activists tools and best practices, in relation to privacy, data protection, technological independence, operational security, accessibility and circulation of knowledge. We cherish creativity in care, an interdisciplinary approach, and JOY ! Our actions evolve around two principal axis that could be: Care for hackers-activists and Hackers ethics and tools for caregivers (but they are not limited to them). We are aware big-hearted hackers and activists are exposed to life-threatening levels of stress and emotional challenges. Some burnout, some are imprisoned or experience limitations or abuse of their rights, in retaliation for their deeds. Some die. Meanwhile, the health-care sectors (where the most vulnerable people become yet more exposed) serve corporate and shady political agendas by default. We, as individuals, as communities, are being “holistically” attacked by the systems in governance. Restrictions on life and freedoms keep intensifying everywhere, motivated by unchecked power and greed. They affect all, in all areas of life, including access to healthcare. These converging realizations and the joys we have in doing what we do all, inspired us to put together this initiative. We want to help be aware of vulnerabilities in our movements, and to organize so that each and everyone's capacities to care and be cared for will not be compromised. We want to install or nurture a culture of care and self-care in the communities we create. And we want to reach out to caregivers, to share'n'care with them ! We have a broad understanding of the concept of care and we practice these arts as powerful means to encourage, mirror and sustain altruism, and to embody a web of trust. With Hacking with Care, we wish to contribute to the resiliency and prosperity of an extended network of caregivers today, hackers-activists, lawyers, journalists, artists, whistle-blowers, many others with or without a “profession” or a name, distant and near, free and imprisoned, each of us node in a human support network. We set up care corners at hackers and activists events, where we make massages, give tutorials, workshops, talk and share documentation… Visitors are welcomed to use the dispositive for their own care sessions, workshops or discussions on related topics. On these occasions we generally team up with other organizations,historically with La Quadrature du Net and their Tea-house. We were at OHM in 2013, 30C3, 31C3 and 32C3 with LQDN, at the Logan Symposium for hackers and journalists with the Center of Investigative Journalism, and at CCCamp15, with the alliance LQDN + CIJ + Courage Foundation + Tactical Tech. We set-up a private care corner for a couple of hours at the quarters of an organization and give medium/short personalized care sessions and/or workshops. We seek to make individual care sessions accessible to hackers-activists, notably by thinking/designing care in/for sensitive contexts. Reciprocal operations destined to caregivers are experimented with, that involve “crypto-care” sessions, thematic discussions, workshops, for example at caregiving schools. 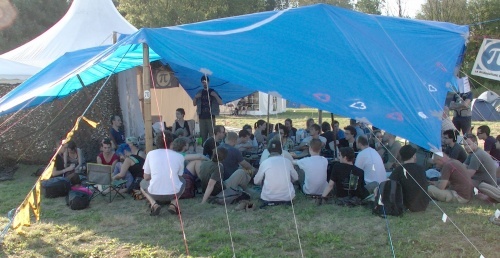 Gatherings where hackers and caregivers mind each others needs for more freedom and autonomy, ones with respect to their bodies and spirits, others with respect to the use of their devices/technology. Our workshops at caregiving schools are infused with Hackers Ethics and P2P philosophy, and some specifically explore the potentials of such ethics and philosophy as applied to the learning, practice, and accessibility/circulation of well-being arts in general. Hacking With Care@CCC15 with LQDN, Courage, CIJ, Tactical Tech - La Quadrature du camp ! Hacking with Care will be present at 33C3 "Works for me" with La Quadrature du Net. Meet us on the Tea-House !